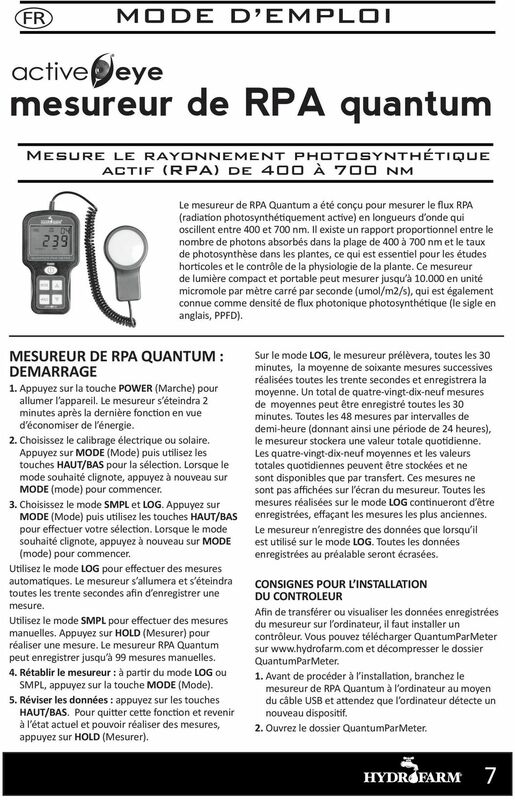 Download "quantum PAR meter INSTRUCTION MANUAL Measures photosynthetically active radiation (PAR) from 400 to 700 nm"
1 INSTRUCTION MANUAL quantum PAR meter Measures photosynthetically active radiation (PAR) from 400 to 700 nm The Quantum Par Meter is designed to measure PAR (Photosynthetically Active Radiation) flux in wavelengths ranging from 400 to 700 nm. There is a proportional relationship between the number of photons absorbed in 400 to 700 nm band and the rate of photosynthesis in plants, which is important for horticultural studies and monitoring plant physiology. 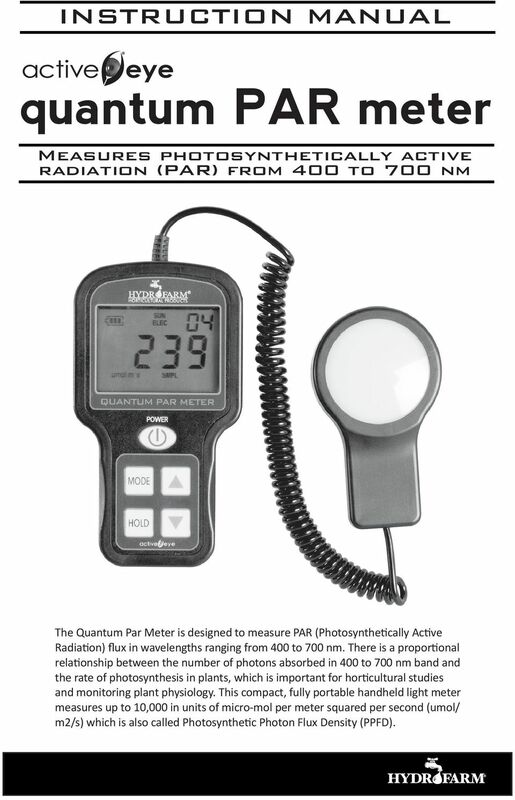 This compact, fully portable handheld light meter measures up to 10,000 in units of micro-mol per meter squared per second (umol/ m2/s) which is also called Photosynthetic Photon Flux Density (PPFD). 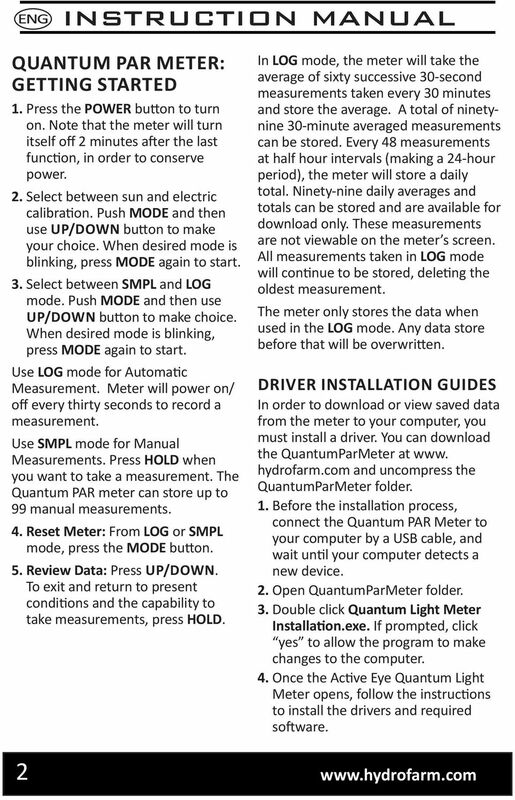 2 INSTRUCTION MANUAL QUANTUM PAR METER: Getting Started 1. Press the POWER button to turn on. 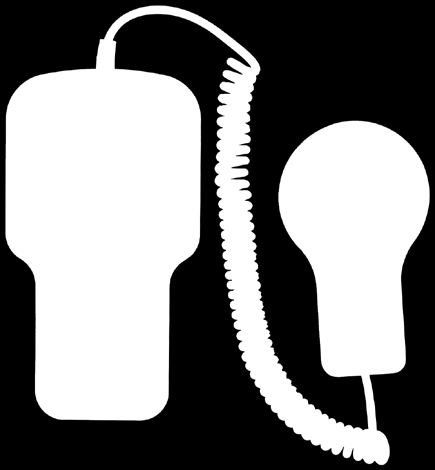 Note that the meter will turn itself off 2 minutes after the last function, in order to conserve power. 2. Select between sun and electric calibration. Push MODE and then use up/down button to make your choice. When desired mode is blinking, press MODE again to start. 3. Select between SMPL and LOG mode. Push MODE and then use up/down button to make choice. When desired mode is blinking, press MODE again to start. Use LOG mode for Automatic Measurement. Meter will power on/ off every thirty seconds to record a measurement. Use SMPL mode for Manual Measurements. Press HOLD when you want to take a measurement. 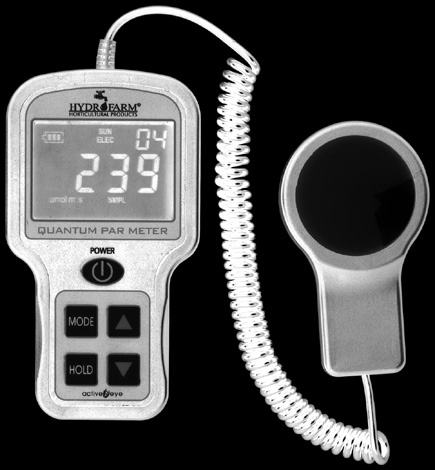 The Quantum PAR meter can store up to 99 manual measurements. 4. reset Meter: From LOG or SMPL mode, press the MODE button. 5. review Data: Press up/down. To exit and return to present conditions and the capability to take measurements, press HOLD. 2 In LOG mode, the meter will take the average of sixty successive 30-second measurements taken every 30 minutes and store the average. A total of ninetynine 30-minute averaged measurements can be stored. Every 48 measurements at half hour intervals (making a 24-hour period), the meter will store a daily total. Ninety-nine daily averages and totals can be stored and are available for download only. These measurements are not viewable on the meter s screen. All measurements taken in LOG mode will continue to be stored, deleting the oldest measurement. The meter only stores the data when used in the LOG mode. Any data store before that will be overwritten. Driver Installation Guides In order to download or view saved data from the meter to your computer, you must install a driver. 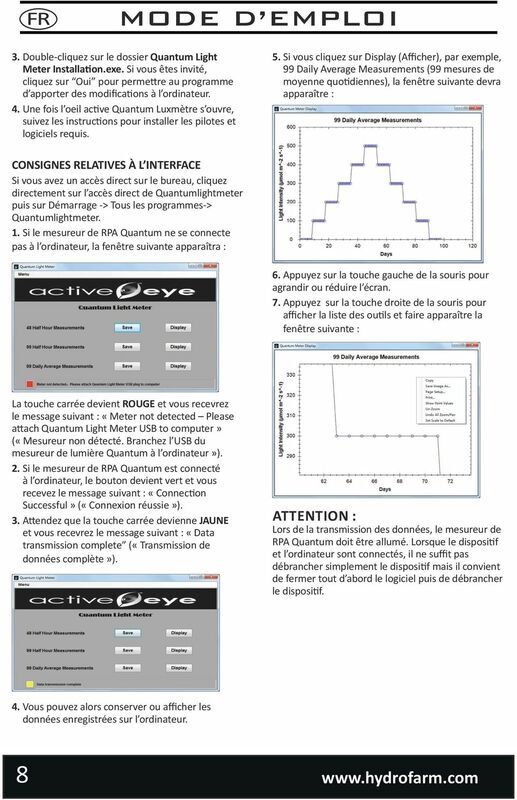 You can download the QuantumParMeter at www. hydrofarm.com and uncompress the QuantumParMeter folder. 1. Before the installation process, connect the Quantum PAR Meter to your computer by a USB cable, and wait until your computer detects a new device. 2. Open QuantumParMeter folder. 3. Double click Quantum Light Meter Installation.exe. If prompted, click yes to allow the program to make changes to the computer. 4. 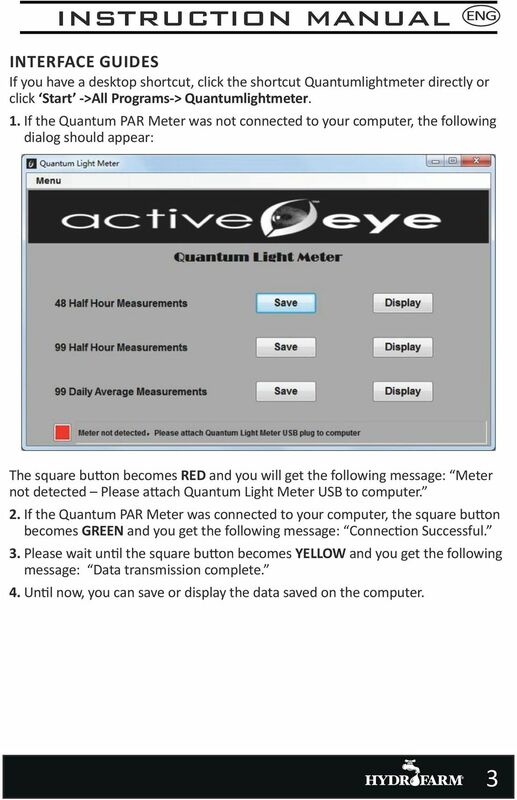 Once the Active Eye Quantum Light Meter opens, follow the instructions to install the drivers and required software. 6 INSTRUCCIONES DIRECTRICES PARA LA INSTALACIÓN DEL CONTROLADOR Para descargar o ver los datos guardados del medidor en su ordenador, debe instalar un controlador. Puede descargar QuantumParMeter en y descomprimir la carpeta QuantumParMeter. 1. Antes del proceso de instalación, conecte el medidor de RFA Quantum al ordenador mediante un cable USB y espere hasta que el ordenador detecte un nuevo dispositivo. 2. Abra la carpeta QuantumParMeter. 3. Haga doble clic en la carpeta en Quantum Light Meter Installation.exe. Si se le solicita, haga clic en sí para que el programa realice cambios en el equipo. 4. 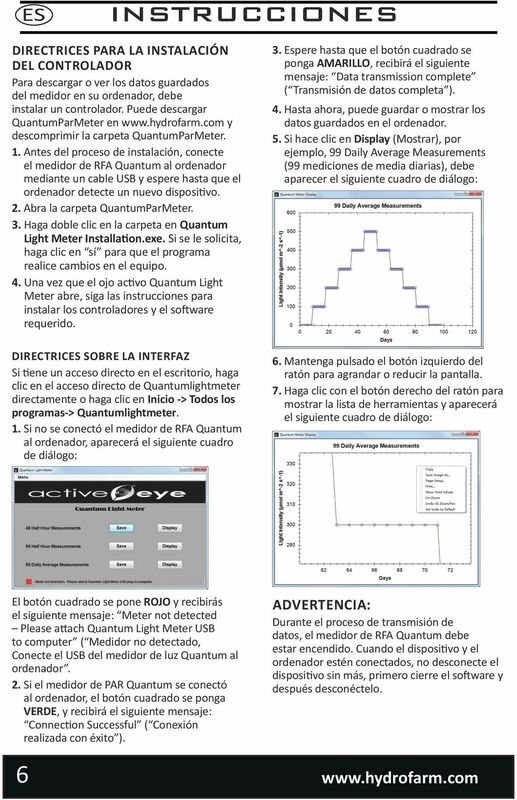 Una vez que el ojo activo Quantum Light Meter abre, siga las instrucciones para instalar los controladores y el software requerido. DIRECTRICES SOBRE LA INTERFAZ Si tiene un acceso directo en el escritorio, haga clic en el acceso directo de Quantumlightmeter directamente o haga clic en Inicio -> Todos los programas-> Quantumlightmeter. 1. Si no se conectó el medidor de RFA Quantum al ordenador, aparecerá el siguiente cuadro de diálogo: 3. Espere hasta que el botón cuadrado se ponga AMARILLO, recibirá el siguiente mensaje: Data transmission complete ( Transmisión de datos completa ). 4. Hasta ahora, puede guardar o mostrar los datos guardados en el ordenador. 5. 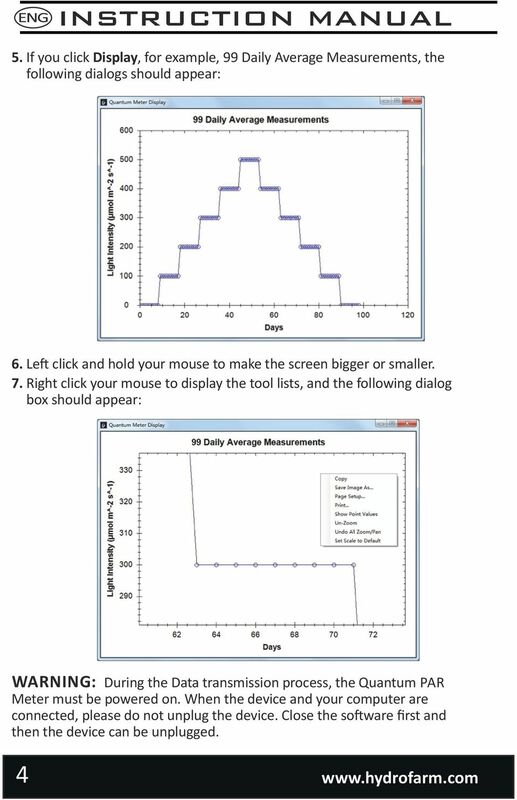 Si hace clic en Display (Mostrar), por ejemplo, 99 Daily Average Measurements (99 mediciones de media diarias), debe aparecer el siguiente cuadro de diálogo: 6. Mantenga pulsado el botón izquierdo del ratón para agrandar o reducir la pantalla. 7. 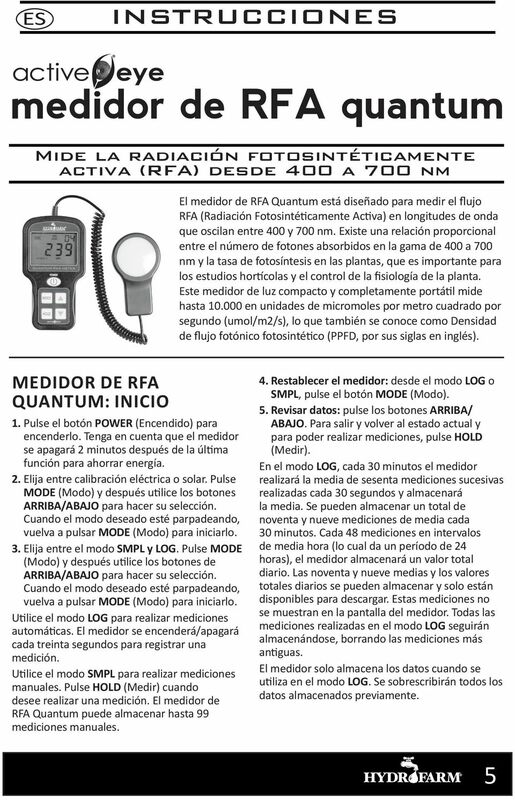 Haga clic con el botón derecho del ratón para mostrar la lista de herramientas y aparecerá el siguiente cuadro de diálogo: El botón cuadrado se pone ROJO y recibirás el siguiente mensaje: Meter not detected Please attach Quantum Light Meter USB to computer ( Medidor no detectado, Conecte el USB del medidor de luz Quantum al ordenador. 2. Si el medidor de PAR Quantum se conectó al ordenador, el botón cuadrado se ponga VERDE, y recibirá el siguiente mensaje: Connection Successful ( Conexión realizada con éxito ). 6 ADVERTENCIA: Durante el proceso de transmisión de datos, el medidor de RFA Quantum debe estar encendido. Cuando el dispositivo y el ordenador estén conectados, no desconecte el dispositivo sin más, primero cierre el software y después desconéctelo. Multigas Detector Quick Start Card Please review the back of this card for a detailed illustration of the following components: Button Button Button Charge battery as needed (rechargeable units only). Download and install Sengled Element app on your mobile device. Connect your IOS or Android device to your 2.4GHz Wi-Fi network. Printer Driver. Ce guide décrit l installation et l utilisation des pilotes d imprimante pour Windows XP et Windows 2000. Dragon Naturally Speaking PRÉSENTATION Équipement Emplacement de JAWS sur le poste désigné Dragon Naturally Speaking (DNS) est un logiciel de reconnaissance vocale permettant de dicter du texte à l ordinateur. MANUAL DE CONFIGURACIÓN DEL CPR (ComPortRedirector) Versión Fecha Versión Software 2.0 Abril 2015 4.3.0.3. CPR CONFIGURATION MANUAL (ComPortRedirector) Version Date Software Version 2.0 April 2015 4.3.0.3.